These are great sounding low cost earbuds. 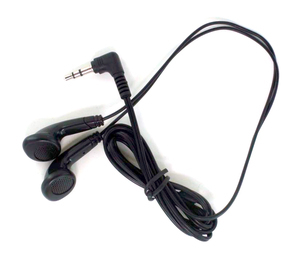 Ideal as a replacement for your broken walkman earphones or as a backup for your expensive isolation earphones so you won't have to be without your tunes. Works great with ipods and all portable music players. Got Ears? Stereo Earbuds2Richard BowersMay 26, 2018I bought these headphones based on your description and the reviews of this product. I am very disappointed. No matter how I use them, I cannot keep the earplugs in my ears. I'm back to using the free headphones I got from American Airlines. These headphones were easy to order, a good price for what I wanted and were shipped promptly. Unfortunately, I can't get them to stay in my ears. Got Ears? Stereo Earbuds5Shirley BallietNovember 30, 2010We really like this product.